Welcome to our Business Directory, designed to meet procurement needs of charity retailers. The product suppliers and service providers listed are all experts in their field and experienced in working within the charity retail sector. Many of the companies listed here sponsored and exhibited at the Charity Retail Conference 2018 – You can view them here. We are grateful for support received from these companies and please make sure you speak to them when looking for new suppliers. Don’t forget to say that you found them in our directory. Simply click on the blue category headings below to view the companies listed. To help charities prevent loss through inadvertently accepting counterfeit banknotes, the Bank of England provides a range of free staff training materials including a banknote app, computer-based training, booklets, posters and deterrent stickers. Materials are available to order via an on-line order form. In addition we recommend charities sign up to our free Banknote Checking Scheme which promotes banknote checking at point of sale through targeted training, in order to reduce the number of counterfeit notes from being passed. If you have any banknote enquiries, please feel free to get in touch. 4G Textiles is a recycling merchant with a difference. We pick up from charities and hospices nationwide; offer industry leading prices; collect the widest range of items for recycling and provide a supremely reliable service to our clients. Great prices, unbeatable communication and service are the cornerstones of our business. We work very closely with our valued charities, both small and large, to tailor a service to suit individual needs whilst providing payments via card, cheque or BACS. We pride ourselves on recycling 100% of the items we collect as we strive to be as environmentally conscious as possible. We provide all your bags for textiles, books and toys free of charge to maximise your revenue. We have an experienced management team with 40+ collective years’ experience in the charity retail sector who are happy to meet for a no obligation chat to discuss your requirements to see if we can help you maximise your charity’s retail potential. ARB is a large recycler covering England with its collections. With over 40 years direct Charity Retailing experience within the ARB team, we like to think we understand the needs of the Charity Retail Sector. ARB pays sector leading prices and offers single, multiple and “clear up” collections. We are proud of our levels of professionalism, with particular strengths being communication and client information. ARB feel that the best way to validate levels of service is to take up current references and we would encourage you to do this. Please contact us for a friendly chat about your recycling needs, we think you will be surprised at the prices offered and our levels of professionalism. ASTCO is an award winning corporate supporter, with many years of experience working alongside many large and small charities throughout the UK. Helping raise much needed funds. We pride ourselves on our friendly, reliable and excellent service, covering most areas throughout the UK, tailor making our service to the needs of each individual charities collections requirements. We pride ourselves on our prompt weekly payments and ability to adapt. Please do not hesitate to call for more information about our services. Better World Books is a socially responsible and environmentally conscious online bookstore. We help you make the most of the books you no longer need by selling them online. These sales generate revenue for your organisation and literacy. We even provide and collect the boxes, ensuring nothing goes into landfill. Choice has served the charity sector since 1999; we have provided a consistently high level of service, have friendly and helpful drivers and have never missed a payment to any of our clients. Initially, along with other companies, Choice just collected textiles but in 2006 introduced the first ever book and other dry waste collection service for charities; at last, instead of unwanted books and other items going to landfill, the books were collected and recycled. Since then Choice has expanded this aspect of our work and hundreds of thousands of carefully selected text books and educational books have been put to one side and subsequently sent to schools and colleges in Africa. In 2015 a new charity was started by the Choice Managing Director so that the process of sending these much needed books to schools and colleges in Africa could be properly processed and monitored. And it is thanks in part to our partner charities that Choice is able to donate hundreds of thousands of older and unsold educational books to support educational programmes in Africa where each book become a most treasured possession. We have a dedicated Customer Service team and a senior manager with forty years direct experience in the charity sector. Please contact Choice on 020 8965 6699 or email info@choicetextile.com; we will be happy to meet you to discuss your requirements and demonstrate that we can provide an excellent service to your charity. CTR Group has a dedicated Head of Charity Partnerships who will conduct regular shop surveys to insist that we are meeting and exceeding our Charity Partners’ expectations. In fact, we offer a tailor-made solution for you and your shops. CTR Group has a can-do attitude and by partnering with like-minded charities we offer the highest levels of service at extremely competitive rates. We can supply our Charity Partners with unique fundraising initiatives including IT collections, Ink and Toner collection programs, Media buy back and many more. We have also teamed up with corporate companies who are looking for charitable partners to support through our collection program. Give us a call, drop us a line, send an email and we will arrange a confidential discussion to show you how CTR Group can benefit your organisation. East London Textiles is a well-established, professional company with 40 years’ experience, specialising in recycling and exporting of used clothing and shoes. Working with some of the UK's biggest charities, hospice and Council authorities nationwide making us one of the largest textile recycling companies in the UK. Goldstone Books are located in South Wales and our fleet of vans provide a scheduled weekly book collection service to more than 300 charity shops throughout Wales, Bristol, Gloucestershire and Herefordshire as well as an ad-hoc collection service as required. We accept all surplus books (except wet books) and every book we collect is reused or recycled. We provide re-useable hessian sacks and ties for the books. We pay above the industry average rates. Individual shops can be paid cash on collection, or via monthly individual or collective bank transfer if preferred. If you are looking for a straightforward way to clear excess books and media musicMagpie can help. It’s a fast, easy and totally free way to sell books, CDs, DVDs, video games and tech, potentially getting more value than if you just send them for recycling. Simply get an instant price for your books (plus any CDs, DVDs, games and tech) using our website or barcode scanning app, pop everything into any box and send it to us for FREE – we can even send a courier to collect your items! With our fast same day payments, you’ll get paid on the same day your items arrive. It’s the quickest, easiest way to sell your surplus stock for a fantastic price. World of Books collect and recycle surplus books from 3500 charity shops every week throughout the UK so we are likely to be collecting from a charity shop near you. We offer a reliable professional collection service and provide stack and nest tote boxes for ease of storage. We accept all surplus books (except wet books) and ensure that every book we collect is reused or recycled. Our service ensures maximum additional revenue for shops and minimum disruption, while reducing waste disposal costs and environmental impact. Contact one of our Charity Liaison Administrators for more information or to arrange your first collection. Allports Group continues to develop the successful Loader Range. The 3.5 ton Easlioader is established as a firm favourite with removal and furniture companies throughout the UK. With our knowledge and expertise, we are perfectly positioned to offer a solution to any companies who need help with any fleet requirements. The Easiloader offers an unique choice of solutions ideal for your business. Please take a moment to visit us and see how Allports Group and our Turn Key Solutions can benefit your organisation. Founded in 2015, The Charity Fleetcare Alliance combines years of industry specific expertise to provide charities with comprehensive cost-saving fleet management solutions. Assisted by technology and with a mind-set in innovation, The Charity Fleetcare Alliance works tirelessly on behalf of UK charities so they may focus on making our world a better place. Acopia Group are a service driven organisation working with charities across the UK providing single source solutions in the supply of goods not for resale. This includes Packaging, Retail Consumables, Janitorial, Shopfittings, Print & Display and Shop Fit-out & Refit Solutions. We are renowned for our honest flexible approach and the values of the charity sector are very close to our own deeply held values of Excellence, Integrity, Responsibility, Passion & Trust. CharitybagsUK.com are specialist suppliers of charity sacks, refuse and carrier bags. A family run business since 2003. Our friendly and efficient staff are always ready to help. FREE quotes and samples available. We also provide storage facilities and nationwide delivery. We offer: Collection packs, carrier bags, refuse sacks, bags for life. With: Artwork and design assistance, storage and nationwide delivery. Experience: A flexible approach, product innovation, competitive prices, value for money. The Charity Retail Consultancy has been supporting charity retailers since 2010, and has more than 50 very satisfied clients. We are unique in having direct, in depth and long-term experience of working within all aspects of the charity retail sector and leading successful charity chains both at regional and national level. We excel in strategy development, charity retail reviews, feasibility studies, staff recruitment, online retail, team training and senior staff mentoring. In a recent survey of our 2018-2019 clients, 100% of respondents agreed that the Charity Retail Consultancy’s support has had a positive financial impact on their retail business, it offers good value for money, it is a great resource for the sector and they highly recommend us to other charity retailers. We’re an award winning team, passionate about both the sector and about running a results-focused charity retail consultancy. Get in touch for a free, confidential and no obligation discussion. Pleydell Smithyman Limited is a specialist design and business consultancy with a multidisciplinary team delivering strategic and design led business solutions across a diverse range of sectors. We can provide a range of services including retail design, planning and business strategy support to deliver bespoke solutions to meet your needs. Skyline Business Services is a nationally established charity retail consultancy with a team of highly skilled charity retail experts that provides a full range of solutions. To discuss these or any other services that will help you improve sales and profits, please contact us. Many charities are taken advantage of by suppliers who rely on the time pressure you are under, their industry knowledge over yours, and the lack of benchmark data available to you. For 20 years Auditel has been a leading cost management consultancy helping charities retain as much of your hard earned funds as possible. 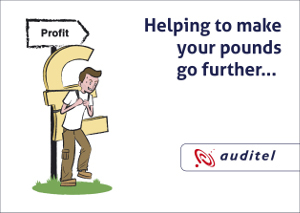 If you are in any doubt as to whether you are obtaining best value from suppliers then please consider speaking to Auditel, and learn how we have helped other members and could help you. Cost Categories covered: Electricity, fleet & transport, Gas, merchant cards, print & stationery, telecoms, water, waste. Inenco are corporate members of the Charity Retail Association. We enable charity members to get the best energy deals, ensuring overheads are minimised. By attaining you the best prices for your gas and electricity, Inenco keep charity’s overheads low and ensure profitability is maximised. Our services save you money on electricity and gas contracts but also give you budget-certainty at a time when energy costs are volatile. Inenco provide access not only to secure pricing and supply but also to emerging technology, sustainability and legislative developments – ensuring customers always stay ahead of the competition. Inenco already work with charities across the UK. As proud new members of the Charity Retail Association, we hope to work with you too. For more information contact Richard Dawson, Head of Partnerships. Shopiago provides ecommerce software to UK charity retailers to enable them to sell online quicker and easier and make more sales at a higher selling price and at a lower cost. Shopiago connects to any combination of eBay, Amazon, Etsy and your webstore and enables charities to sell online anywhere and everywhere using a single set of tools. It helps you search for, identify, value and list donated goods to any sales destination in just a few minutes then manages all of your stock, orders and messages from every destination, all in one place. It takes just five minutes to set up, is quick and easy to use and its integrated messaging tools ensure that you have access to expert help whenever you need it. Shopiago – ecommerce for good. Currently working with over 100 independent charity organisations since our inception in 2011, BMc Azurri is one of the fastest growing suppliers in the Charity retail sector. Our easy to use Gift Aid solutions, EPOS, web-based reporting and hosting services have all been created specifically for the charity sector with simplicity at the core, ensuring that volunteers can easily adopt and use our systems. Our partnership with K3 Retail, has enabled us to integrate our charity specific software with their extensive range of solutions for the retail sector. We currently work with The Salvation Army, The British Heart Foundation and Sue Ryder to name a few, delivering Gift Aid Software and a range of IT Services from a single charity specific supplier. Our own ability to provided nationwide installation and support services is made possible by being part of the Barron McCann Group. Should you be interested in joining the growing family of charities who manage their Retail IT Services with BMc Azurri, we’d love to talk to you. CRS are specialist suppliers of Sharp scanning tills and Touchscreen Terminals for the charity retail sector, with over 900 installations in leading charity shops nationwide. CRS’ software covers flexible Gift Aid, new and donated goods, stock control, loyalty etc... Easy to use cost-effective solutions with professional training, support and service. VectorCharity by CSY Retail Systems, providing easy-to-use charity shop EPoS solutions. With volunteers at the heart of charity shops, it’s important to make sure the tills and systems they use to make completing transactions, tracking stock, managing sales and claiming Retail Gift Aid are as easy-to-use as possible. Being built on our established Vector software your charity can also benefit from comprehensive stock control, ecommerce, reporting and loyalty functionality together with charity specific functionality such as Retail Gift Aid, RAG Analysis, Volunteer Statistics and much more. CSY offer full nationwide coverage for sales, installations and training. CharityStore from Cybertill is a modular retail system installed in around one in three of all charity shops in the UK, from small hospice chains to large nationals. The cloud-based CharityStore solution is designed to help charity retailers increase revenue and simplify processes, including EPoS, stock control, ecommerce gift aid, loyalty, mail order, lottery, eBay and more. It is the most cost effective solution, delivering an impressive return on investment whilst still being simple to use and manage. Eproductive is the specialist software firm that uses powerful technology, simply applied to deliver cloud-based performance management and engagement systems in the charity and hospitality sectors. Pioneers of Retail Gift Aid, enabling our clients to claim over £200 million, we have been at the heart of charity retail as a trusted partner for over 15 years. Our systems support over 100 charities with innovative Gift Aid, EPOS, training and engagement solutions. K3 Retail partners with charities to provide connected technologies, ensuring you can reach your goals now and in the future. We intelligently apply our technologies to make charity retailers’ lives easier and businesses more successful with tools designed to forever meet your consumer demands. Our one stop shop charity solution provides charity retailers with everything they need to manage their retail stores. With gift aid made simple from BMC Azurri, combined with K3 Retail POS, Loyalty & Donations functionality, Stock Control & Merchandising, together with all your back office needs – all volunteer friendly in a familiar easy to use Microsoft environment, means you can focus on what’s important to you – your charity and leave the technology to us. Charities from English Heritage, Oxfam, RHS and RSPB are able to pursue their business goals with the expertise of K3 Retail and our partners in delivering the new possible. Kudos makes EPoS easy to use for charities, so you sell more at the tills, reduce admin time and have a simple process for Retail Gift Aid. By offering an effective, well-supported solution for stock control of new, donated and refurbished goods and pick-up and delivery management for furniture re-use Kudos remains the only charity retail systems provider with 100% customer retention. A two times Charity Retails Award winner, NISYST provide integrated business IT solutions for charity shops. Their volunteer-friendly EPoS solution CHARiot covers donated and purchased goods and is combined with powerful retail management tools as well as charity retail-specific reporting as standard. CHARiot boasts a fully integrated Gift Aid module and offers the only HMRC recognised route to claiming Gift Aid on rag. Tengo Software’s Charity EPoS Software tengoPOS is the UK’s leading charity gift aid EPoS till system. Originally developed in 2004, it is now used by charity shops and visitor attractions all over the UK. Over the years, every charity we’ve dealt with has increased revenue with us. Our Gift Aid EPoS software will simply ask you for the initial, surname and post code of your donor. There are no complicated forms to fill in, and your operator is in control, meaning gift aid becomes painless and your customers are much more likely to supply their information. Queue times are also unaffected due to the speed with which donations can be processed. Donated items can be tracked with ease. In addition we have a charity specific CRM solution covering all aspects of managing a charity, from fundraising, accounts, and grant management, through to stock, membership and events. We also include HMRC approved Gift-Aid submission, all done automatically online with a single click. Wil-U is a tablet-based modular system designed specifically for charities that makes increasing Gift Aid revenue and connecting with supporters and volunteers easier and more affordable than ever before. The collection and delivery of furniture and electricals for charities is a unique challenge. Boxmove’s F&E solution has been engineered to save charities money, while delivering the sort of experience that customers expect from high-end retailers. The result: more donations, faster throughput of stock, happier customers, greater insight and less management time spent - all at a lower cost than dozens of one-man operations. How? We install iPads in all shops and provide a complete digital logistics solution, tailor built around collecting and delivering used furniture: SMS updates, real-time vehicle tracking, weekly reporting. With zero admin cost, our system allows us to pay the national living wage to all our full-time, uniformed, CRB-checked staff. We will work with you to build a highly profitable greenfield F&E operation: we can offer logistics, warehousing, stock listing and a complete eCommerce F&E site. Insurance for the charity and not-for-profit sector can often be complex, with each organisation facing its own unique set of risks and exposures. Our Charity team is made up of experienced insurance professionals who have been handpicked from within our business for their expertise. We understand how important it is for charities to get it right, particularly as the sector remains under the media spotlight. Our team of specialists can help and advise you on all aspect of your risk management and insurance so you can be rest assured that you have the cover you need at a premium you can afford. Over 100 years of innovation have gone into making Brother the global business solutions provider that it is today. Founded in Japan in 1908, and now operating in 44 countries around the world, Brother has continually adapted to thrive in an ever-changing marketplace. From managed print services through to printers and scanners, Brother’s products and services are designed to increase efficiency, boost productivity and encourage collaboration in the workplace. Brother UK has secured Investors in People ‘Platinum’ status and, most recently, a prestigious Queen’s Award for Enterprise in recognition of its outstanding achievements in sustainable development. This year, Brother UK marks its 50th year in business. Please contact Simon Brennan. Above all, we’ll support your charitable operations in style. Birketts is a top 100 UK law firm with offices in Cambridge, Chelmsford, Ipswich and Norwich. We have one of the best regarded and largest dedicated Commercial Property teams within any firm outside London, numbering over 100 specialists with extensive experience of acting for both charity retailers and commercial retailers. Our specialist Charities and Social Enterprise Team works closely with our core business teams of Corporate and Commercial, Commercial Property, Dispute Resolution, and Private Client to provide a seamless service. Our clients trust us to achieve a solution that is right for them, however difficult or challenging the circumstances. “FREE WILLS FOR CHARITY”. These four words sum up McClure Solicitors. Founded in 1853, we have grown from a small provincial firm to a UK wide legal company with offices in England and Scotland. Our Free Will Service generates the demand and all of our other services result from that. We make your Will free of charge for a donation for a charity of your choice. 45% of clients take a Power of Attorney (at half price) and 15% take a Family Protection Trust. In the first six months of 2017, we have raised over £17m for charities in Donations, Gift Aid and Legacies. No wonder over 70 charities are partnered with us. Charity and voluntary sector work is at the heart of Stone King’s 200-year-old practice. We are recognised as one of the UK’s leading law firms for charities and have one of the largest teams of specialist charity lawyers in the country. We act for several hundred voluntary organisations and provide practical solutions to problems based on our in-depth knowledge and experience. We understand that ‘charities mean business’ and we bring that approach to our advice. We are very pleased to be providing the Charity Retail Association legal retainer service to members. We supply over one million items of new goods annually to the charity retail sector. Rouge offer excellent service and an unrivalled collection of furniture, Christmas novelties and fashion apparel at highly competitive prices. White Brothers supply new goods into the charity retail sector. Our offerings consist of a core range of men's and ladies accessories and a wide and varied range of clearance lines from major high street retailers. eBay for Charity makes it easy for members of the eBay community to support their favourite charities when buying and selling in one of the world’s largest marketplaces. They can donate a portion of their sales, add a donation to purchases during checkout, or buy an item that supports a great cause. Special features help eBay for Charity's items stand out, and charitable sellers are rewarded for their generosity with eBay fee credits proportional to the amount donated. eBay for Charity is powered by PayPal Giving Fund and so far has raised over £100m for thousands of UK charities. TripGiving from Tengo Software is an online giving platform which can handle simple donations, multiple appeal donations, in addition to online ticketing and events – all for one simple transaction fee that is cheaper than both Just Giving and Virgin Money Giving. TripGiving can also be integrated with CRM and EPoS systems, and comes with online reporting and direct integration to HMRC for claiming Gift Aid on your donations. Contact us today to get your charity listed and save money on your online donations – there’s no setup fee and no monthly fees to pay! Accepting & re-selling 2nd hand electrical goods is an easy way to increase stock & income for your Charity. First Stop Safety help charities sell electrical goods safely by supplying everything you need to PAT test easily, affordably & quickly. We manufacture our own simple PAT testers and deliver affordable PAT training. E-Learning is also available. Start earning more money in your shop – start selling electricals! MSL Retail Property Care Services provide a complete property care solution encompassing reactive and planned maintenance, statutory and environmental compliance assurance programmes and building fabric works to retail and business sectors nationwide. Chris Carey’s Collections Ltd are a family run textile and shoe recycling company based in London. CCCL offer charity collection services for National, Regional, Local charities and Hospices. We collect throughout London and the Home Counties ensuring that all material collected is sorted and processed in accordance with all waste regulations and have a zero landfill policy. Our rates are competitive, and our service is unrivalled. Our collection teams are friendly and helpful. I&G Cohen Ltd is a dynamic, service led business at the forefront of textile recycling since 1959. We are driven by our passion to divert ever increasing quantities of textiles from landfill through recycling and reuse. We offer a comprehensive range of clothing bank, kerbside collection services and charity shop collections providing recycling and fundraising opportunities for our partners. All items collected are processed within the UK to create specific products for suitable export markets around the world. JMP Wilcox was established in 1895, a family owned group reclaiming and processing textiles. As one of the largest reclaimers in the UK with fleet of over 50 specialist vehicles servicing charities and local authorities from 2500 collection points nationwide. Recyclatex (The Reuse and Recycle Group) is thrilled to partner with the CRA. Consisting of eleven companies, with over 500 years combined experience, we offer a nationwide professional service to charity retailers, with one point of contact. By working with Recyclatex, charities can be sure that they are dealing with reputable and reliable businesses, who are part of the largest textile reuse and recycling group of companies in the UK. We are the easiest way for charities to raise money from their unsold and non-saleable old and vintage donations for free. We accept gold and silver, gold and silver-plate, costume jewellery, coins, medals and militaria, watches, cameras, writing and smoking instruments, old games and toys. No hassle or cost to you… it’s free! Vintage Cash Cow for charities is helping charities raise more money for their cause. We provide national cover using an experienced team loss prevention managers, who are all sympathetic to the unique requirements of the charity retail sector. With over 40 years in retail, Hughes Escott offer interior/exterior services including mechanical/electrical (NIC approved), signage, graphics, design concept, working drawings/specification, buildings & property maintenance. We operate across the UK. Kimpol Ltd provide a commercial refurbishment service, working on a national scale, that can be tailored to meet your specific requirements. Working for organisations planning their first project to those with multi-million pound national structures and substantial in house property teams, we pride ourselves on industry leading levels of service, quality and professionalism on every project. We are involved in “re-fresh” programmes, dilapidation works, Fire Risk Assessment remedial works as well as re-fits of existing units and the fit out of new acquisitions. With 30 years working in the charity sector - we think we are specialists. Mansell Associates specialises in the design and implementation of retail interiors with the objective to consistently deliver innovative yet considered design solutions whilst getting projects open on time and to budget. The practice offers a range of design and implementation services from concept design to project management including Access Audits and compliance with Construction (Design and Management) Regulations 2015. Whether the service is a separate task or a fully integrated package, our services are designed to the client’s specific brief. We have a proven track record of assisting small retailers to grow and multi-site roll out programmes for major retailers. We are dedicated in helping you realise your retail vision and stock over 7,000 products for retailers. 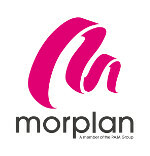 Morplan is the one-stop for all your retail needs, offering everything from shop fittings, showcases and mannequins to carrier bags, hangers and tickets. Many products can be over-printed with your company name or logo. We can even help you design your store with our on-line 3D planning system allowing you, using your phone or tablet, to see the finished result before you buy. Contact us today online 24/7, call 0330 44 55 666 or visit our stores in London, Birmingham, Glasgow and Bristol. Founded in 1983, RB UK is a dedicated business providing a range of shopfitting, shelving and storage supplies. We operate a hugely successful drop ship operation for our larger items such as Boss Shelving Units and an extensive range of office furniture delivered to customers on your behalf. We supply charities, wholesalers, retailers, independent DIY and hardware stores, as well as some of the largest DIY chains in the country. If you have a concept, we can make it a reality, with our bespoke wood and metal manufacturing division. We focus on giving a personalised service to each of our customers to ensure we provide the best possible shopping experience. With a highly trained sales team and technical advisors to answer any queries you may have. 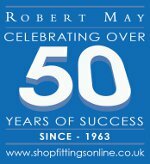 This year we are celebrating 50 years of supporting the retail sector with high quality shop fittings from around the world. In addition to helping you identify the right product, our friendly and knowledgeable staff are happy to assist you with developing new equipment and display concepts. We have been working with the charity sector since 1987 and are proud to support the wide number of stores that raise money for good causes. Charities receive preferential rates on most of our products. As a vital part of the retail supply chain, Robert May takes every opportunity to purchase effectively from our global supplier base, helping to reduce costs and maximise profits for our customers. “Heritage, Quality & Expertise” supplying independents and multiples from our base in Manchester since 1864. The ever changing retail environment means we are always re-inventing what we offer to you as customers and believe that good service means something different to every customer. We always try to ensure that you will enjoy personal product solutions, along with service levels which we can tailor to your individual requirements. We understand that your customers need to recognise that your individual in-store brand identity need to be visually different from your competitors and we will always endeavour to help you achieve this quickly and in a cost-effective way. We are constantly seeking to develop new products, finishes and materials and we feel that listening to both our customers and suppliers is crucial to this process. In summer 2017 we are going to open a brand new showroom and as much as it’s our showroom we want it to be your space to discover what your shops can look like in the future. We are a fun loving, passionate team who are ready receive your enquiries. So, no matter how big or small your VM or shop fittings project is, please give us a call and see how we could help you stand out on today's crowded high street. Within our company ethos we passionately believe that with profit comes responsibility to society. 30 Years’ Experience within the Shop Equipment retail industry. Metal Manufacturer in house. Bespoke metal work. Friendly & advisable team working closely with the Charity sector. Celebrating their 35th anniversary this year, Elle Media Group have always been at the forefront of the Charity greeting card industry. Specialising in Charity greeting cards, gift wrap and stationery they really can do it all. They are FSC certified. Most of the competition will say they use FSC board but Elle Media Group hold the certification…did you know you can check out if a supplier is FSC certified by putting their certification number in here www.info.fsc.org/certificate.php and all FSC product claims must carry a logo with their number on. They are the only charity greeting card publisher in the UK with an in-house design studio, card show room and state-of-the-art printing facility all under one roof. Elle Media Group actively encourage customers to visit their premises and even see their cards being printed in the factory. Through years of experience, working closely with some of the UK’s best known charities, Elle Media Group are proud to say they are experts in high return fundraising. They know that locally relevant designs can really offer a competitive edge, and quite simply there is no one who does this better than them. They are experts in bespoke commissions and have a fabulous design team on hand to work around the clock on designs to ensure your rough sketch or photo is transformed in to a truly wonderful work of art. But that’s not all, last year Elle Media Group became a member of Sedex (www.sedexglobal.com). Sedex is home to one of the world’s largest collaborative platform for buyers, suppliers and auditors to store, share and report on information quickly and easily. The platform is used by more than 38,000 members in over 150 countries to manage performance around labour rights, health & safety, the environment and business ethics. This in itself shows their willingness to share and utilise information to help manage and improve ethical standards within the supply chain. Elle Media Group are also proud to be ISO 14001, ISO 18001, ISO 12647-2 accredited. Ling Design Ltd - Charity Cards Made Easy! Charity cards are an ideal opportunity to connect with existing and new supporters and raise awareness of your charity whilst increasing your fundraising. With over 45 years experience in the Greeting Card industry Ling Design is one of the UK’s longest established suppliers of Greeting Cards to charities and fund raisers, producing over 5.5 million charity cards each year. Here at Ling Design we have a wealth of imagery specially selected and painted for the Charity fundraising sector for both Christmas and Every Day. We offer a bespoke artwork service from our in-house studio, competitive pricing and a reputation for timely delivery of quality cards. Our friendly dedicated Charity team are always available; happy to help and advise throughout the process. It is important to us that your charity builds a unique range which reflects your identity and purpose to your supporters. Please give us a call – we would love to help! The Gifted Stationery Co are the preferred supplier of Calendars, Diaries & Gift Stationery to some of the largest Charity Retailers in the UK. Focusing in on bestselling formats, the ‘Gifted Offer’ ensures that excellent sell-thru’s are achieved, producing a guaranteed margin contribution. Eye catching point of sale is provided as a key vehicle to deliver attractive displays that support the sales drive. A range of risk free supply options are also available to ensure the charity partner is ‘clean’ of stock after the festive trading period. Our Charity partners rely on our product expertise, sustainable product content and ethical sourcing to ensure this market sector is delivered each year, on time, at agreed profit margins. To find out how we can support your retail goals, please get in touch with our dedicated charity sales leader Andrew Wilton. The Great British Card Company started life as Paper House back in 1980 and has grown both organically and through acquisition, most recently acquiring The Almanac Gallery and previously the greetings card business of The Medici Society – first established in 1908. The Company works with hundreds of charities, both large and small, and offers in excess of 900 designs in its Christmas card ranges each year through its Paper House, Medici and Almanac brands. Your working partner for over 30 years generating increased revenue at point of sale. Propress steamers give unmatched results, performance, quality and reliability, instantly removing creases from all fabric for perfect presentation. Dedicated staff for fast-track service to charities. Health & Safety support. Fairport Containers is the UK’s leading refurbisher of waste containers and donation banks. A family run business with over 20 years of experience, we can offer you an extensive quality service. With three refurbishment centres in the North West, South West and South East, we offer national coverage to all of our donation bank customers. Each centre has the capability to fully refurbish your banks. Fairport can offer full logistical support to you with our specially adapted Hiab wagons, trailers and moffetts at a highly competitive price. 1st Waste Management are now in our 9th year as a partner of the CRA and 6th year as a Charity Retail Conference Headline Sponsor. We are delighted to be able to continue to offer the sector considerable savings on their waste services and now have the ability to offer extended services on clinical and medical waste streams. WE COULD SAVE YOUR CHARITY MONEY AND TIME!